KANSAS CITY, Kan. — In a room filled with a majority of Kansas City, Kansas firefighters, Mayor Mark Holland presented his report of “corruption” within the city’s fire department. “When you’re willing to compromise the safety of the city in order for you to gain financially that’s the definition of corruption,” he said. The report focused on shift trading, a common practice in fire departments across the country. One firefighter agrees to work another’s shift. Both employees are paid as though no trade ever took place because the same two people are expected to trade back. “If there is some type of corruption, something being done illegally, the building across the street [the courthouse] is where to take it,” said Robert Holland, KCK Fire Captain and business manager of IAFF Local 62. In his presentation Thursday, Holland said shift trading is being abused. He showed payroll data collected by the Unified Government which showed thousands of dollars paid out to employees who did not work. According to the report, KCK firefighters had been paid $920,000 in taxpayer money in 2017 for work they didn’t do. “I am sad to report today I think the corruption of the Kansas City, Kansas Fire Department goes all the way to the ninth floor of the city hall and that is why we don’t have change because we have people unwilling to face the facts much less address them,” he said. Commissioners who did not attend Thursday’s meeting refuted the mayor’s claim. Thursday’s presentation happened hours after Kansas City, Kansas initiated an investigation into a KCK firefighter’s Facebook post. 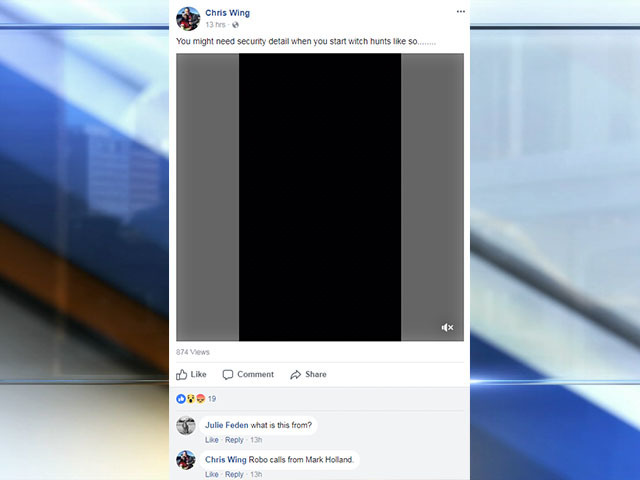 The Facebook post was written by Chris Wing, KCK Fire Captain and business manager of IAFF Local 62 Robert Wing’s son. It accompanied an audio from a robocall sent by the mayor Wednesday evening, which alerted residents of Thursday’s meeting. “I have every belief that these issues will be taken up in the courthouse or the federal courthouse,” said Robert Wing. Wing told 41 Action News he, his son and the union have all retained attorneys. Trading time is an accepted, legal practice which is allowed under federal law and the labor contract between the Unified Government and the KCK Firefighters Union. The issue facing the Unified Government is when the trading time practice does not follow policies and procedures. In 2017, the Unified Government Board of Commissioners directed UG staff to examine the issue. The information gathered will be utilized to review and evaluate the trading time practice making sure it complies with Fair Labor Standards Act provisions and negotiated contract terms. In the next several months, KCK Fire Department management and Unified Government administration will analyze the data collected, implement administrative changes, and bring recommendations for changes or improvements back to the Commission for consideration. Any recommended policy changes are subject to collective bargaining and will be discussed during labor contract negotiations with the Firefighters Union for the 2019 contract. This issue is portrayed by some as the Unified Government versus the KCK Fire Department. This is absolutely not true. The KCK Fire Department is an important part of the Unified Government. Firefighters are valued employees who save lives, while frequently risking their own.